Voters in Issaquah, Washington narrowly rejected Proposition 1, a ballot measure that if passed would have repealed the plastic bag ban and bag charge. The measure lost by a narrow margin of only 350 votes. The King County Department of Elections reported that out of 19,302 registered voters in the City of Issaquah, a total of 7,590 ballots (or 39.32%) were returned by mail and counted. A total of 3,595 “Yes” votes (47.68%) and 3,945 ‘No” votes (52.32%) were cast. The “No” vote keeps the bag ban ordinance previously passed by the City Council in place. Proposition 1 was placed on the ballot by a grass roots group called Save Our Choice. Save our Choice was founded in December 2011 to first oppose the Seattle bag ban and bag tax and is a band of grassroots volunteers dedicated to fiercely defending consumer and merchant choice. Save Our Choice collected more than 15% of all Issaquah voters to qualify the measure for the ballot in October 2013. (Clark, 2014) Subsequently, Mr. Craig Keller, cofounder of Save Our Choice, successfully challenged the ballot title and description in court and won several much needed wording improvements to the ballot title and description. According to Mr. Craig Keller, co-founder of Save Our Choice, Proposition 1 would have easily won had more grass roots volunteers turned up to help with the effort. Mr. Keller stated that few volunteers came out to help during freezing cold and windy weather prior to the election to stand outside stores handing out “message” bags and “Free Issy” decals before the election. Each “message” bag was a plastic bag with a message to vote “Yes” on Proposition 1 as shown in the illustration. Mr. Keller noted that collecting signatures or handing out plastic “message” bags and decals was not without incident. On numerous occasions some store managers have called the Issaquah Police Department and that he had to stand his ground and school Issaquah Police Officers that the sidewalk in front of a store is a “public forum” and available for the exercise of political speech according to both state law and the First Amendment to the U.S. Constitution. Issaquah’s Proposition 1 was on the ballot in the February 11, 2014 special election. Most of the measures on the ballot were related to school district funding, maintenance, and capital improvements that may have brought a certain type of voter out, such as parents of school age children who might have been more supportive of the bag ban. Mr. Keller also believes that if the proposition to overturn the Issaquah bag ban had been on the ballot in a general election it would have won. 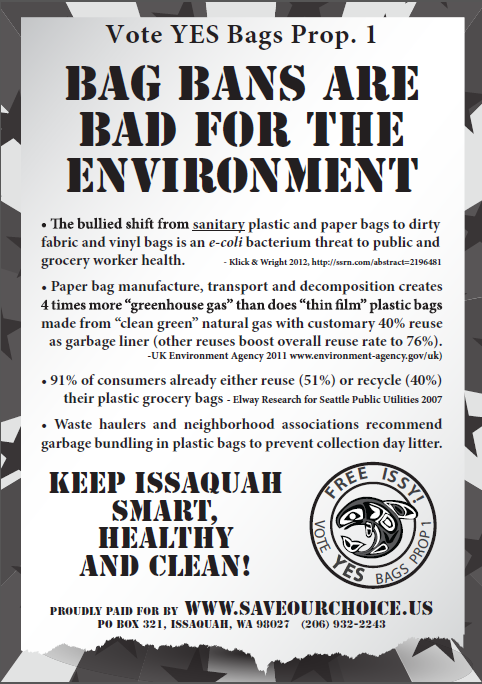 Also, on the ballot was a measure for the City of Issaquah to annex the nearby county area of Klahanie which does not have a bag ban. The measure lost by 32 votes. Save Our Choice leafleted two precincts in Klahanie encouraging voters to reject annexation based upon Issaquah’s nanny state bag ban and red light cameras. Mr. Keller stated he thinks Save Our Choice helped to shape that outcome. The fact that the race was so close showed that at least half of voters do not believe that the city council should impose lifestyle choices on residents by stripping away personal choices as to what kind of shopping bag works best for them. I feel for the person that worked so hard on this. Your effort is appreciated, and I bet those employed by the plastic recycling business thank you. In California, hundreds of people may lose their jobs due to this ban. Remember when paper bags were verboten? Now, they are again in vogue. Same thing will happen with plastic bags. They are not only recyclable, but they are made from product that should be recycled again. Too many people are being willfully ignorant of the facts when a vote can produce this result.